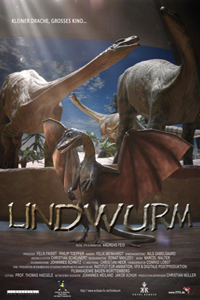 While the project had a rather difficult pre-production with multiple story revisions, and a tenacious shooting at the Natural History Museum in Stuttgart, the more intense body of work dealt with the creation of a catsized "lindworm" (or "wyrmling") and its more naturalistic creature behaviour in combination with character-driven motifs. The work on the dragon, as it had to be integrated into live-action plates, required a step up from the rather surreal work in Terra Sancta in every aspect: Sculpting, rigging, animation, rendering and compositing all increased in detail and complexity. Special care was put into the rigging to automate more dynamic portions of the body such as the tail and wings, in order to speed up animation time; and the shading of the dragon was dealt with exclusively during compositing to allow more flexibility. About half of the footage in the trailer was either manipulated or 3D-reprojected for additional fixes and camera movements in post. The trailer itself, as being part of the ITFS festival, is regularly screened throughout the entire festival period along with those of fellow students and colleagues. In 2013 the trailer was licensed to become the official trailer for the Dragon Days 2013 in Stuttgart.